Check out the 4 best home security systems including DIY wireless systems and professionally installed systems that can be customized for each household. Protect American is a self-install home security system company that’s been in business for over 25 years. Its standard professional monitoring plan is $19.99 per month with no upfront cost. You can customize your home security system for more per month. A leader in smart home technology, Vivint offers multiple ways to secure your home. Its home security systems include door and window sensors, glass-break detection, cameras and motion sensors. You can build your own home security system for a customized price point. Monitoring plans start at $39.99 per month with a $549.99 upfront cost. 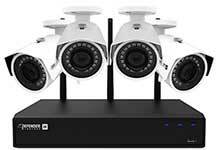 Defender offers simple and affordable wireless security systems that can be installed yourself. Prices start at around $149.99 for one camera and control panel. Defender comes with no contracts or monthly fees. Frontpoint is a leader in self-install wireless home security systems. Price points fluctuate based on how you customize your home security system. Systems come with a hub and your choice of indoor/outdoor cameras, intrusion sensors and hazard sensors. Monitoring plans start at $34.99 per month with a $149.95 upfront cost. We evaluated 15 Home Security Systems and selected the four best choices after carefully researching each one. The companies that ranked highest are Protect America, Vivint, Defender, and Frontpoint. 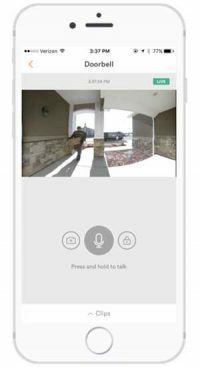 In this guide, you will learn about the types of home security systems, tips for choosing one to fit your needs and we’ll share our detailed evaluations of the top companies. You will also find helpful frequently asked questions about home security systems in this guide. Before you sign a monitoring contract, be clear on whether it’s long-term or month-to-month and if there are early cancellation penalties. If you have existing smart home products, check to see if they will mesh with security systems you’re considering. Check with your homeowner’s or renter’s insurance company to see if your home security system qualifies you for a premium discount. The latest statistics are staggering, with 69.5 percent of all burglaries in unoccupied homes resulting in $3.6 billion in losses. Robbery of occupied dwellings accounted for nearly 17 percent of all crimes in 2018, costing victims over $79 million. Home security systems help deter crime, a fact backed up by a study from the criminal’s perspective done by the University of North Carolina — Charlotte’s Department of Criminal Justice and Criminology. Sixty percent of the felons interviewed for the study said they would seek another target to rob if there were a home security system on the property. Customizing a home security system saves money. Footage recorded through security cameras can be stored online or locally in your home on a hard drive. 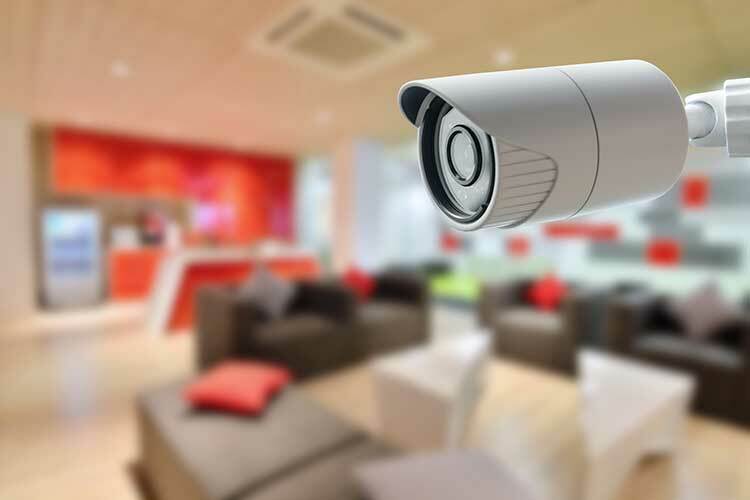 Deciding where to save camera footage is a serious consideration since having visual proof of theft or vandalism is probably the primary reason you want to buy a home security system. – Cloud storage involves the camera sending video to online storage space via your home’s Wi-Fi network, where it can be viewed using an app or online. No need to buy an external hard drive or dedicate space on your home computer to video. No concerns about running out of storage space. When the video files’ size nears your data limit, the system automatically deletes old files (unless you have locked them). One of the disadvantages of using the cloud is you may have to pay monthly fees for storage space and you will probably need to upgrade your Wi-Fi if you’re currently on a budget plan. If you forget to lock footage you want to save, the system will probably delete it when the storage level gets high. – With Local storage, the home security video streams to and gets stored on a hard drive or other media in your home, like a DVR, microSD card, network video recorder (NVR) or closed circuit system (CCTV). Cameras wired to the storage device won’t bog down your home network. Little to no time delay when observing activity on camera from inside the house. No monthly or annual storage fees. Disadvantages of local storage are paying more upfront for the equipment and installation can be a hassle. Also, if you’re using a microSD and someone breaks into your home and steals the camera, the footage goes with them. Factor in fees associated with a new home security system into your budget. Common fees found in the home security industry are for installation, activation, service, relocation and cancellation. Always read the contract thoroughly, paying particular attention to the details surrounding a free deal. You will have upfront costs to establish the system and for equipment. Professional monitoring usually comes with monthly fees unless you opt for a quarterly or annual program. DIY home security systems cost the least, frequently advertised for around $200 for a one-time fee. If you have a warehouse club membership like Costco, that price can drop to $165. However, these starter kits usually only have at most four sensors, which is inadequate for most homes. Start adding sensors and you’ll see prices closer $400 to $700. However, you can easily save that amount within 12 to 18 months if the system is self-monitored. The cost of equipment and professional installation for a monitored home security system runs from $500 up to $1,200. Add a five-year monitoring contract and the total out of pocket averages around $2,000 on up to $3,000. Monthly monitoring fees range from around $20 to $60 per month. Consolidate by pairing a home security system with smart home devices. Smart locks and lighting have a place in today’s home security systems. Smart locks are controlled by a smartphone app with no keyed lock to help deter a stranger from entering your home. Smart lighting, also controlled by a phone, can integrate with your security system to turn lights on at various intervals automatically, so it looks like someone is always home and awake. You can also control lights when you’re away from home and can turn on inside and outside lights for greater safety when you arrive home. Take advantage of a wireless home security system if you can. Wireless technology in home security systems has nearly replaced wired systems. Hard-wired systems may be less expensive, but the professional installation required can get complicated and pricey. However, if the property you want to protect does not have cellular service, you’ll need to go with a wired setup. A wireless home security system allows for the installation of sensors, motion detectors and cameras nearly anywhere there is Wi-Fi or cellular coverage. No drilling is required, and a cut landline can’t render the security system useless. Wireless systems make it possible to view your home and see alerts directly from camera feeds on your smartphone or tablet. A professionally-installed security system may put your mind at ease, but take a look at do-it-yourself home security systems. Today’s DIY home security systems come in kits with simple, easily-installed components. You don’t need to drill any holes, and there are no wires. DIY home security systems are usually less expensive compared to those requiring a pro to install, and you can easily find a capable system with no long-term contract if that’s your preference. Of course, if you have no interest in installing a DIY home security system, you can’t go wrong by signing up for installation and paying for the service. Some self-monitored systems charge for the mobile app. You will pay more for home monitoring services, but they are the most effective. When you sign up for monitoring, an agent gets an almost-instant notification if your alarm is tripped. The agent will try to call you to determine if you need help, or if it’s a false alarm situation. You will give the agent a secret password you set up in advance to confirm your identity over the phone. If you don’t pick up the phone or the person who answers doesn’t know the password, the agent will alert the authorities. If emergency responders dispatch to your home on a false alarm, chances are you will receive a bill for service from the municipality. Self-monitored home security systems can save a few hundred dollars each year. These systems are typically DIY and communicate by sending an alert to your smartphone if a sensor detects an intrusion. The downside is if you are far from home you may have no way to determine if you’re receiving a false alarm. You will be in a potentially stressful situation when an alert is triggered and will need to decide whether to call 911. If your smartphone battery dies or otherwise fails, or cell coverage is blocked or unavailable, you won’t get alerts. Weigh the cost savings with the probability your home could be broken into to decide whether to get home security alerts or go with a monitored system. We found a self-monitored home security system that charges a monthly fee to keep the mobile app activated, nearly equal to monitoring service fees. Know if the alerting app is indeed free or if there’s a charge to keep getting alerts. 1. We searched an extensive list of 15 home security systems. 2. We evaluated the companies based on our expert-guided buying criteria: ratings from independent companies, reviews from customers, equipment costs and expansion options, monthly monitoring fees and overall industry ratings. 3. We provided you the best home security systems for consideration. Once you decide to invest in a home security system, all the decision making about equipment needs and provider options begins. Luckily, we researched security systems for you. Our in-depth home security analysis focuses on each company’s industry reputation, variety of offerings and other criteria. We researched 15 home security systems. Then we narrowed the list based on specific criteria we set by extensive research, including government and consumer information. In addition to consumer ratings, monthly and one-time costs and custom home security options, we looked for companies with highly-rated customer service. The result is our list of the four best home security systems. Protect America keeps things simple by offering three bundle plans: Copper, Silver and Platinum. Each plan includes a standard control panel, door and window sensors, a yard sign and window stickers and professional monitoring for one monthly price with no upfront cost. However, these plans have no security cameras, which cost between $99 and $169 each. Protect America home security systems work with Amazon Echo devices and other smart systems to control door locks, garage door and lights. Each Protect America plan can be upgraded to include a variety of video and smart home automation for an additional fee. Installation is free. Read our comprehensive Protect America review for more details on the company’s products. Vivint, the leading smart home services company in North America, seamlessly blends home security with home automation. Vivint offers six different security packages with expansion options and the ability to add specific components. Each kit comes with the Vivint Smart Hub, Sky App, a yard sign and light and at least six smart sensors. Among the assortment of options smart home components include the ability to control lights, appliances, thermostats, voice recognition technology. Vivint home security systems run on cellular networks and require professional installation. Prices we found online for components cost $39 for a small appliance control on up to $199 for a pan and tilt video camera and automatic door locks. The bundles cost from $710 to $1,790 with a four-to-five-year contract. The company offers free design consultation, and qualified customers can take advantage of Vivint Flex Pay, a no-interest installment loan with 60 monthly payments from around $12 to $30. For more details on Vivint and its products, read our comprehensive Vivint review. Defender home security systems have no monitoring contracts, no monthly fees and require no professional installation. Defender kits provide a local storage unit, wireless cameras and a mobile app so you can view recordings from anywhere. The three Defender models come with from one to four cameras and systems cost from $149 to $549. Additional cameras cost $99.99, and optional accessories are available to extend the system. Each Defender home security system comes with free shipping, 30-day money back guarantee, 12-month warranty and the option to purchase an extended warranty for an additional 12 months. For more details on Defender’s home security packages, read our complete Defender review. Frontpoint DIY home security systems are tested before shipping to work right out of the box. You can set up a Frontpoint system in about 30 minutes, and choosing the right home security level is very straightforward. Answer a few questions on the Frontpoint website to get three personalized recommendations with costs and monthly monitoring fees. If you prefer to browse packages, Frontpoint has six ranging in price from around $130 to $1,333, and you can add components to customize your home security system. Use the “Build Your Own” option to create a system from the ground-up. Regardless of how you design a Frontpoint home security system, discounts of up to $300 are available. These systems utilize professional monitoring. Read our comprehensive Frontpoint review for more details. Will my pets set off home security system motion detectors? Your pets shouldn’t cause an alert. Typical motion sensors won’t detect anything under 40 pounds, and sensors with different weight settings are available for larger dogs. Modern home security technology can distinguish between the motions of humans and animals by calculating speed and movement patterns. If the power goes out, will my home security system still work? Modern security equipment comes with battery backups that can last up to 72 hours to keep your system running. Backup batteries last up to five years. I need to register my new home security system. What does that mean? Some cities and counties require home security system owners or the monitoring service companies to register an alarm system or get a permit before sending emergency personnel to the address to investigate an alarm. Contact your local police department or city hall to determine if your city has this requirement, and remember to ask about the cost of false alarms. How can I avoid setting off false alarms from my home security system? To avoid false alarms, occasionally test your system to ensure it’s running correctly. Know the code for the keypad so you can enter it on the first try to disarm the alarm. Close and lock all doors and windows before you leave the house to ensure sensors are aligned. And, while it’s unlikely you have any items that can fly through the air in your home, you’ll want to keep light objects like balloons away from the motion detectors. 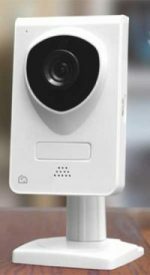 What is video quality like on home security cameras? Today’s security cameras use high-resolution technology to deliver crystal clear video both indoors and outdoors. There’s an excellent chance you’ll get a shot of the face of anyone in the camera’s range. Can I take my home security system with me if I move? Yes, you can move your system from home to home. Smart locks may take some effort to remove and replace with standard locks, but this can be done to avoid the cost of a new home security system in the new location. Break-ins happen at a rate of one every 13 seconds. A security system can help keep you from becoming a statistic while making you feel safer in your home. Home security systems are an investment worth considering for extra protection and peace of mind. The ability to combine a security system with smart home options is a plus, and it’s easier than ever to find an affordable home security system to protect your family and assets.